10th All India Bal Bharati Inter Unit Sports Meet 2016, the annual mega sporting event organized by Sports Council, (a body of Child Education Society) was held from 24th October 2016 to 26th October 2016 at Bal Bharati Public School, Rohini. The event spread over 3 days witnessed participation of about 1100 students from 18 units of Bal Bharati all over the country in sporting events under 7 categories namely Athletics, Badminton, Basketball, Chess, Table tennis, Tennis and Volleyball. Bal Bharati Public School, Rohini hosted 481 students and teachers in its premises from 9 units across the country. The Opening Ceremony was held at BBPS, Rohini on 24th October 2016 and was a magnificent display of sporting synergy and cultural extravaganza. The Chief Guest of the occasion was Shri Vijay Goel, Minister of State- Youth Affairs, Sports (IC) & Water Resource and the Guest of Honour was Shri Kapil Dev, an ace Indian Cricketer. The event was graced by Shri L. R. Channa, President, CES, Members of Board of Management and the Principals of Bal Bharati Schools. The eminent guests were welcomed by Ms. Rekha Sharma, Advisor, CES. The programme started with the marching of contingents from all the units of Bal Bharati Schools along with the school bands. The students displayed exemplary marching finesse and precision in their synchronized movements. Thereafter, the gathering was addressed by Shri L. R. Channa, President, CES and Shri S.K. Bhattacharya, Convenor, Sports Council. The torch of the Annual Sports Meet was lit and carried forth by the talented sports achievers of BBPS, Rohini. The group leaders of all contingents came forward to take a solemn Oath to abide by the rules and ethics of the game. Shri Vijay Goel spoke to all students and shared the vision and strategies of Government of India to encourage Sports in the country, more specifically in Delhi. The sky was filled with colourful balloons as the Annual Sports Meet, 2016 was declared open. 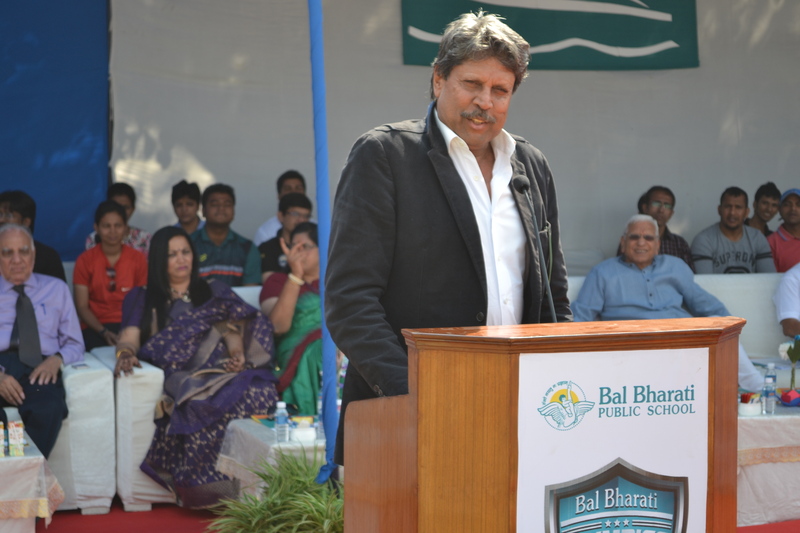 Shri Kapil Dev in his address emphasized on students’ need to ‘Believe in themselves’. The Vote of Thanks was proposed by Ms. Geeta Gangwani, Principal, BBPS, Rohini. The cultural programme of the opening ceremony began with the presentation showcasing the different forms of exercises which included Yoga, Aerobics, Sari drill and Umbrella drill. The dance presentation included folk dances from India. The loudest round of applause was reserved for introduction of the mascot of the Sports Meet 2016- Shera with the motto ‘Excelsior’ penned on him. The opening ceremony ended with National Anthem. Immediately after the Opening Ceremony, the students participating in the events reported to their respective venues and sporting events began with great zeal and competitive spirit. The matches for Volleyball, Chess and Table Tennis were held at BBPS Rohini whereas the athletic events, matches of Basketball, Tennis and Badminton were held in BBPS, Pitampura. The athletic events included 100 m, 200m, 400 m, 800 m, high jump, long jump, shot put and triple jump for both girls and boys and 1500m for boys only. The participating teams were cheered by the audience comprising of students from all units. All the Sports Directors, Physical Education Teachers and Coaches got a golden opportunity to interact with Dr. Dhananjoy Shaw, the officiating Principal of Indira Gandhi Institute of Physical Education, University of Delhi on 24 October 2016. He elaborated on the Science behind physical education and motivated all present to inculcate regular exercises in the daily routine. The Organising Committee of 10th All India Bal Bharati Inter Unit Sports Meet 2016 ensured that state of the art infrastructure conducive to the smooth conduct of games was provided. Furthermore, League matches were held till the quarter finals for all team sports so as to ensure that every team gets an opportunity to play maximum number of matches. The officials from reputed Sports Associations and Federations, namely, Delhi Basketball Association, National Institute of Sports, Chattrasal Stadium, Volleyball Federation etc were roped in for expert review and judgement. The Sports Council introduced the use of gun start & photo finish in athletics to ensure nano precision in judgement, keeping in view the close finish that happens in Athletics. The year 2016 saw inclusion of Chess for both Boys and girls and 1500 m in athletics for boys. On 25th October 2016, the events continued at both the units as per the schedule culminating on 26th October 2016 by 2.30 pm. The Closing Ceremony began at 3.30 pm on 26th October 2016 at BBPS, Rohini. The esteemed guests on the occasion were Shri Bahadur Singh, an Olympian and Shri Rajkumar Sharma, Dhronacharya awardee. The event was graced by Shri L. R. Channa, President, CES, Members, Board of Management and the Principals of Bal Bharati Schools. The illustrious gathering was welcomed by Ms. Rekha Sharma, Advisor, CES. The cultural programme included a melodious rendition by the choir of BBPS, Rohini and the dance presentations- Kavadi Attam by the students of BBPS Simhadri, koli dance by BBPS Navi Mumbai and Punjabi folk dance by students of BBPS, Ludhiana. The Report highlighting the events spread over three days was presented by the Principal of the host school, Ms. Geeta Gangwani. It was followed by the most awaited segment of the day’s programme- the Prize Distribution Ceremony. The trophy for Overall Champion was jointly bagged by BBPS, Pitampura and BBPS GRH Marg. All the players of BBPS Pitampura and GRH Marg took a victory lap of the playground and were cheered loudly by the audience. BBPS, Navi Mumbai was the Runner up. The Annual Sports Meet, 2016 was declared closed by Shri S. K. Bhattacharya, Convener, Sports Council, CES. The flag of CES was handed over to BBPS, Ludhiana for the conduct of 11th All India Bal Bharati Inter Unit Sports Meet 2017. The Annual Sports Meet 2016 ended amidst great cheer and celebration. The three days of the meet and the sporting talent exhibited by the students of Bal Bharati schools validated Child Education Society’s commitment to the cause of holistic education. IF you receive mail from sandhya_kakkar@outlook.com ,please ignore as it is a fake id created by a hacker .